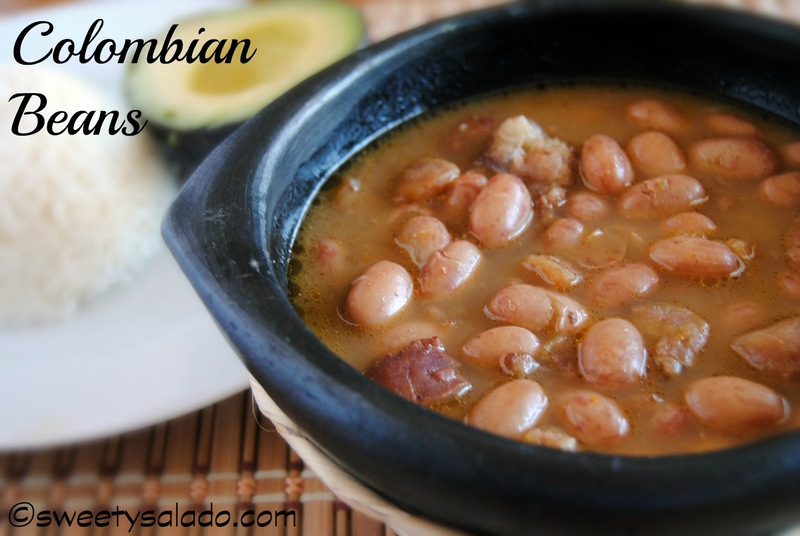 The one meal that I remember eating the most when I was a kid was beans, Colombian style beans. When we were living with my great aunt, she used to make them every night and would serve them with a side of white rice, beef or chicken and a Colombian arepa. And it’s funny because we never got tired of eating them, in fact, people would come over for dinner uninvited because her beans were amazing. As kids, my cousins and I would make fun and sarcastically ask, “Hmmm… I wonder what we’re going to have for dinner tonight?” But like I said, we loved them and ate every single bit of them. In Colombia we eat beans all the time and every family has their own recipe. The most popular way to make them in Antioquia, which is where I’m from, is by adding ham hocks or pork hocks, along with a green plantain. My grandmother loved adding collard greens or “cidra” which is a type squash, also called “chayote”, but that’s not really the way I like them. I want my beans meaty and full of pork flavor so I almost always use ham hocks. If you’re not too fond of adding a pig’s foot in your beans, or can’t find any, you can also make them with pork belly which also gives them an amazing flavor, same with bacon, except most bacon sold here in the US is smoked and then your beans won’t really have that Colombian flavor. The type of beans we always use are cranberry beans which are very easy to find here in the US. These beans are gorgeous, they have beautiful red spots on the outside that are usually lost during the cooking process and are packed with flavor. Also, the ones sold in Colombia are a lot bigger than the ones we find here but they taste the same. If for some reason you can’t find them at your grocery store you can use pinto beans or even red beans. Serve this dish with a side of white rice and a nice piece of avocado. They’re amazing!¡Buen Provecho! 1. Wash and soak beans the night before in about 5 cups of water. 2. Heat 2 tbsp of oil on medium high heat in a big pot or pressure cooker, then add ham hocks and brown for about 5 minutes. 3. Add bay leaf and garlic and stir for about 1 minute. Add beans with 8-10 cups of water, the plantain, the carrot and the aliños. Then add the rest of the water making sure the beans are covered. Add more water if needed. 4. If you’re using a pressure cooker, add 1 tbsp of oil to prevent the water from foaming. If you’re using a regular pot, you don’t need to add more oil. 5. Cover pressure cooker and bring to pressure, then lower heat to medium low and cook for 25 minutes. Cook for 1½ – 2 hours on medium low if using a regular pot. 6. Remove from heat and let rest for 5 minutes before releasing the steam. 7. Once all the pressure is released, uncover and remove ham hocks and let cool. Remove bay leaf and discard. 8. Remove carrot and put it in a blender with about one cup of beans and liquid from the pot and blend until smooth. Then add it back to the beans. This will help thicken the liquid and it will add the carrot flavor. 9. Once the ham hocks have cooled, remove the meat and add it back to the beans. Discard the bones. 10. Taste for seasoning and add salt and pepper to taste. Serve with a side of white rice and avocado. This ain't da' way my abuela use to cook habichuelas but I'll nevertheless give your version a try. Thanks! This is an awesome recipe to try and a pretty basic way of making them Colombian style. 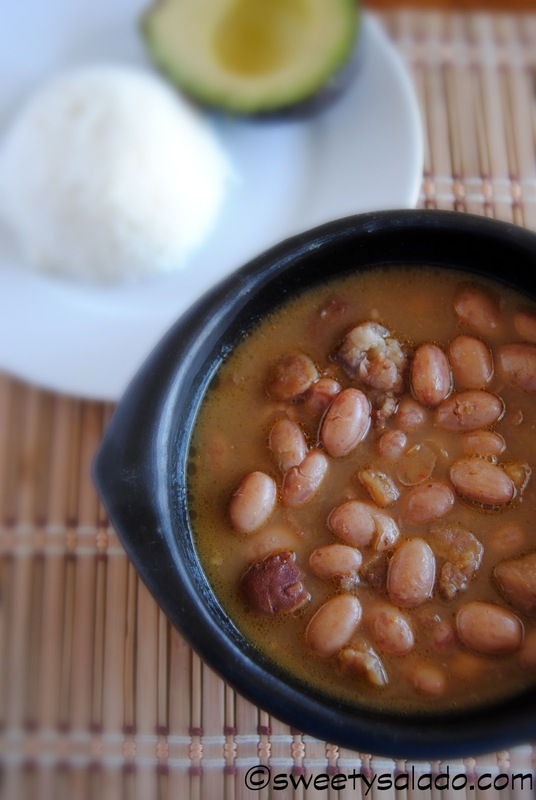 Since you're calling them "habichuelas", would it be a good guess to say that you're grandmother makes Puerto Rican style beans? When I was a kid one of my mother's friends, who was from Puerto Rico, gave us a taste of her PR beans and they were preeeety amazing. Yes indeed, my abuela made Puerto Rican style beans. btw… should I presume that the word "habichuelas" is used only in Puerto Rico to describe beans and not in any other latin-american country as well?I've often heard the word "frijoles" before but I've always thought of frijoles as being but mashed-up beans. I've only heard Puerto Ricans call them "habichuelas" and if you ask for a bowl of habichuelas in Colombia, they'll give you a bowl full of green beans. In some parts of Colombia beans are also called "frisoles" which never made sense to me. LOL. You say "most bacon sold here in the US is smoked and then your beans won't really have that Colombian flavor." I take that to mean that the meat shouldn't be smoked in order to have the most authentic flavor – is that correct? The ham hocks at my local grocery store are smoked. Would that make it taste different? Thanks! That's correct. In Colombia we usually don't eat smoked meat, so our food doesn't have that smokey flavor. I have made these beans with smoked bacon and they've turned out pretty awesome, however, it's not a Colombian flavor. If you want them to be authentic, then try to find bacon or ham hocks that are not smoked. I know it's hard because I almost never find them unless I buy them from a Mexican butcher shop. You can also try pork belly or just make them without any meat which is also a way many people in Colombia make them. Im really looking forward to trying this recipe! Two years ago i tried to recreate Colombian style beans for my family who where visiting us by doing a bunch of research however back then there weren't very good recipes so I had to take tips from mssg boards. I lived in Long Island NY for 10 years with my inlaws. One of r fav places to eat was Mi Tierrita Colombian Rest. I LOVED their beans and rice and the green hot sauce, that's all I would order, well along with sweet bananas. My same inlaws will be visiting us again, two years later and I wanted to try the beans again and started to google recipes and came across your blog!!! I was so excited after watching your you tube videos bc the recipes appear like what I am use to. I just cant wait to try them TODAY! Thank you so much for all your hard work!! I know what its like to blog (I blog too) and i'm just so exited!!! My husband is Colombian and he had me eat this when I was pregnant with our daughter I and I absolutely loved them! I make it almost every Sunday. I also dice up red, brown and white potatoes and add them to the soup along with Pico De Gallo. Hi Jennifer, you made me laugh with the "he had me eat this" comment! You can never go wrong with Colombian style beans and I bet pico gives them a great flavor. We usually serve them with hogao which is really nice but not spicy.